How do you AutoResize forms so that they fit individual pages and browser sizes? Kindly let us know whether you were assisted. Thanks for getting back so promptly. Let me reword a litte: I don't want to changethe dimensions of my form. I want the dimensions to be retained in other people's browsers (including mine when it is minimized. So I am trying to retain the proportions of the form, and I am trying to keep the form INSIDE the web page. See my screenshot above. This is how my form looks on a minimized browser. It sticks off the webpage and runs over the text in the next column. JotForm's codes are optimized to automatically resize itself without sacrificing form appearance. I have a feeling, that you used full source code for your form. In this case, the form is affected by your site's styling, making it look disorganized in a browser that has limited dimensions. What is the URL of the page where you have embedded your form? Which type of embed code did you use? Try embedding using iFrame or Embed <> method, then let us know how it goes. Hi Neil, I tried iframe too. even tried lightbox. I'll give embed a retry. but so far no matter how i insert it, I have th problem shown in the earlier screenshot I sent. Initially, I just used the Google sites icon. It is a Google APPS site if that makes a difference. I have since looked at my other jotforms and they do the same thing. It was more obvious with this form because I had a column to the right of the form that had text in it. The other forms had nothing else on the page. I've since removed the text columns from the page this payment form is on. It still does the same thing (runs off the page) but now there's no text for the form to run over. My site is not yet public so if you give me an e-dress, you'll be able to see it personally. OK just tried using the blogger tool. Since its googles I thought it worth a try. VERY INTERESTING !!! IT DOES NOT run off the page but it does cut the form off when your downsize the browser. SO the question now is: How do I prevent it from cutting off the right side of the form??? I am going to go back to the standle google icon insert for now. Prices & Options link is not visible on the sidebar - clearheartcoaching.com. I would love to check it out for you. 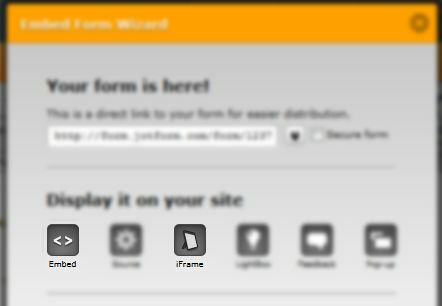 Changing the form width should do the trick as autoresize is not active. I believe your website (www.clearheartcoaching.com) isn't viewable by guest. It says "Insufficient Privileges", you need permission to access this item. Can you please recheck the access permission for us? Thanks in advance. Update: clearheartcoaching.com (without www) is accessible but there's no Prices & Options link? Just like what Mr. Goldo stated above. Kindly recheck. Thanks.